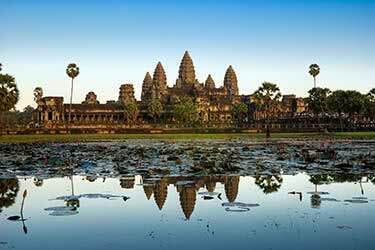 This 14-day tour highlights the beauty, history, culture and resilience of the Cambodian nation. 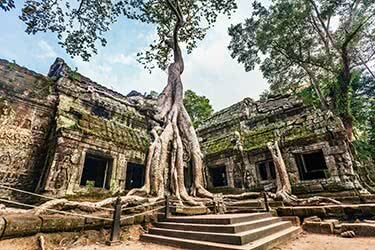 From the mysterious jungle-tangled temples of Angkor to the mountain-hemmed white-sand beaches of the south, and all the rarely-visited villages of the North, this tour has something for every type of traveller. 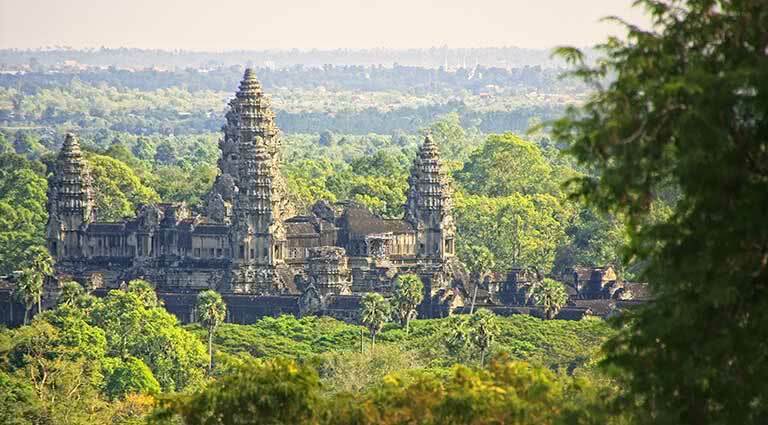 On your journey from Phnom Penh to Sihanoukville and back again, stop at such mesmerizing sites as the Cheung Ek Killing Fields and ancient temples of the Angkor Kingdom. 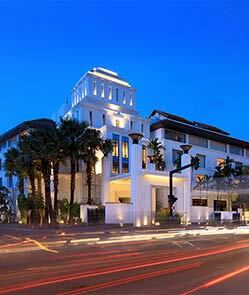 A guide will welcome you upon your arrival in Phnom Penh and transfer you to the Rosewood Phnom Penh. Check in and freshen up before an afternoon of sightseeing. 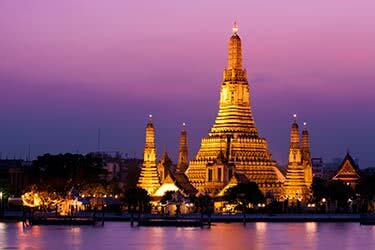 Visit the Royal Palace, and the Silver Pagoda, also known as the Temple of the Emerald Buddha. Marvel at the nearly 200-pound Buddha made of solid gold, made in 1907. The pagoda is filled with fascinating artifacts, each providing a window to the past. Today begins with a somber tone as you visit Toul Sleng Genocide Museum and the Cheung Ek Killing Fields. It is in this very space where thousands of civilians were killed and buried in mass graves. You are sure to be moved by the reminders of such atrocious crimes against humanity in this important space honoring the dead. Return to the city for a visit to the market or take a bike and pedal out to the countryside to Silk Island for a peaceful afternoon. After breakfast, travel to Kampong Cham, with a stop or two along the way. Check in to your hotel before enjoying some sightseeing - visit the city’s male and female hills, Phnom Pros and Phnom Srei, respectively, and 12th-century temple, Nokor Bachey. 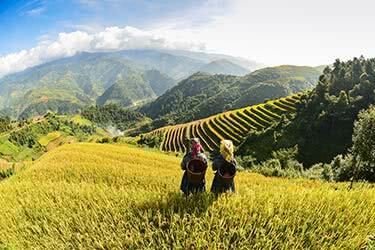 Climb up Han Chey Mountain and take in a sunset view, followed by dinner at a local restaurant. 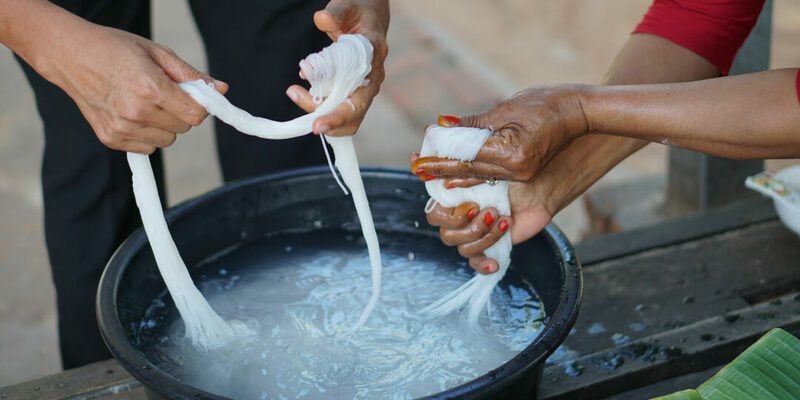 After checking out of your Kampong Cham hote, explore the rubber plantations, rubber being one of the region’s top exports. 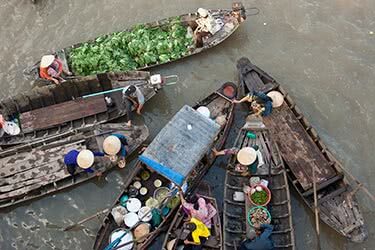 Transfer to Kratie and check in to your hotel before taking the unique opportunity to visit the Mekong dolphins on a boat excursion. These rare freshwater dolphins are most active in the early morning and late afternoon hours. A morning drive will bring you to the province of Stung Treng. Take in the beautiful plateau landscapes along the way. Check in, rest and refresh before an afternoon of teaching English to monks and the local disadvantaged. A scenic boat ride will bring you to the village of Preah Rumkel, where you will meet a homestay family. 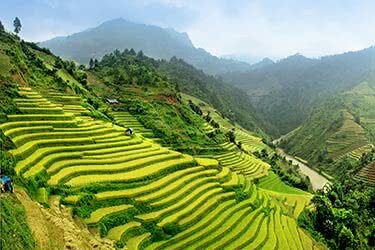 This is an eco-tourism site hemmed by Mekong River rapids, waterfalls and forested hills, providing a lush verdant vista. Interact and break bread with a local family who will welcome you to spend the night in their traditional wooden home. Today you will explore the tropical forests of Preah Rumkel. By mountain bike and foot, make your way to the top of a hillside to fully appreciate the incredible panoramic views of the countryside below. Keep an eye out for wildlife in the RAMSAR flooded forests and conservation area. Enjoy a peaceful sunset over the Mekong and forest landscape, followed by a typical dinner and the region’s famous rice wine. 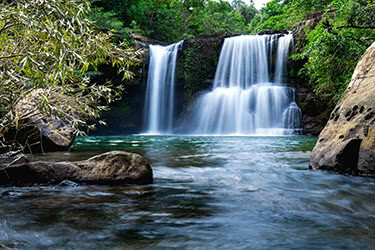 Enjoy a three-mile adventure walk with a local guide to breathtaking Sopheakmith waterfall. Take a motorbike transfer to Kompong Simi en route to Preah Vihear, where you will enjoy dinner and spend the night. After breakfast, journey to the Thai border to visit the Preah Vihear temple. Climb to the top of Dangrek Mountain to take in the spectacular view of Thailand. 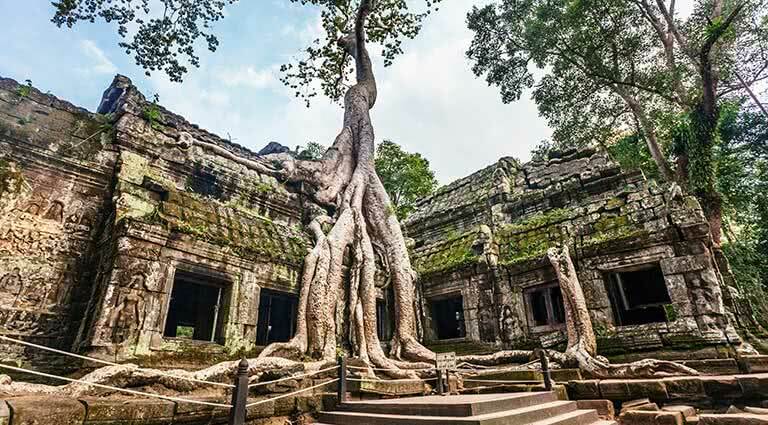 Journey to the past on a history-based tour of this pre-Angkorian temple, a protected UNESCO World Heritage Site that is infamous for its border-straddling controversy. 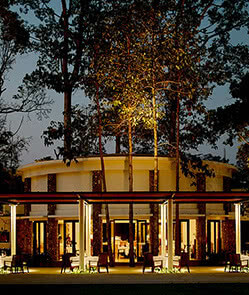 Travel to Siem Reap, and check into one of many luxury hotel options. Enjoy breakfast at your hotel before a tour of the area’s ancient temples. 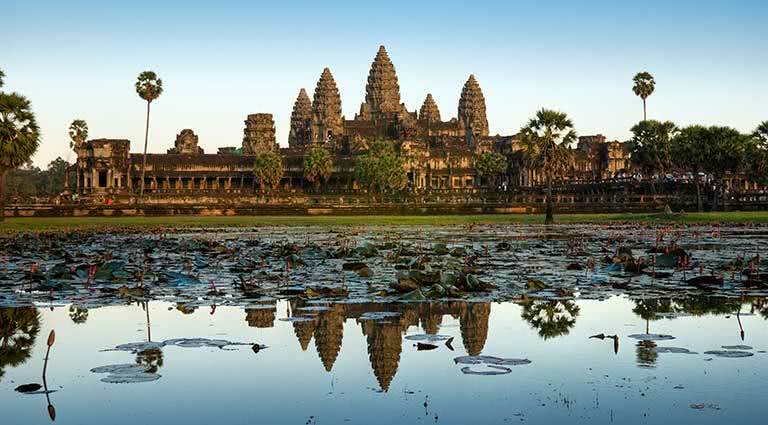 Visit the 12th-century sites of Angkor Thom, Angkor Wat, and Bayon. Take in the sights of the South Gate with its massive statues depicting the churning of the Ocean of Milk. Continue on to the Royal Enclosure, Phimeanakas, Elephant Terrace, and Ta Prohm, one of the region’s most incredible sights. 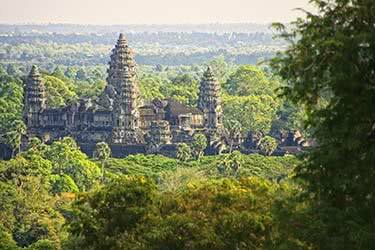 Hop on an Angkor Gondola at Angkor Thom, and travel from the south gate to the west gate. 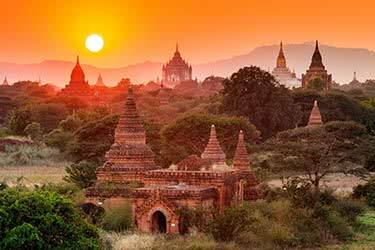 Round off the day with a climb to the top of Bakheng Hill for a spectacular sunset view over the ancient city. Today, visit Koh Ker temple, built by king Jayavarman IV, and dedicated to the Hindu god Shiva. Next stop is Beng Melea Temple, which, covered in a thick layer of lush moss, resembles a blue sandstone façade. Take the time to observe the locals making joss sticks – traditional incense – and other everyday activities that can be seen along the roadways. Enjoy breakfast at your hotel before transferring to Sihanoukville. 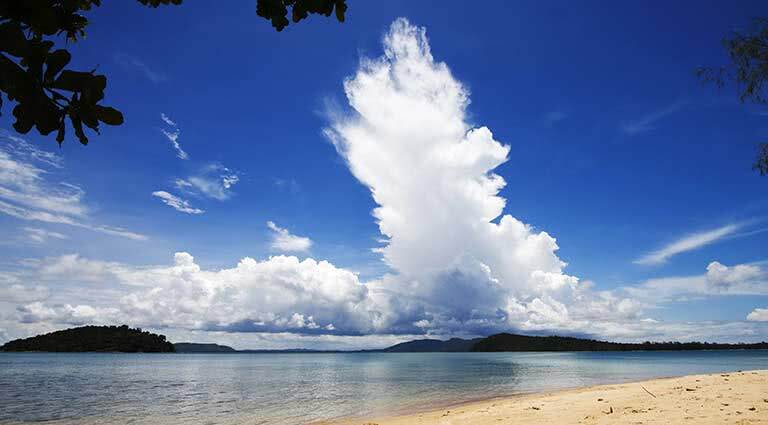 Relish in the beauty of the mountainous countryscape before checking into an island resort, whether Song Saa or Alila Koh Russey. 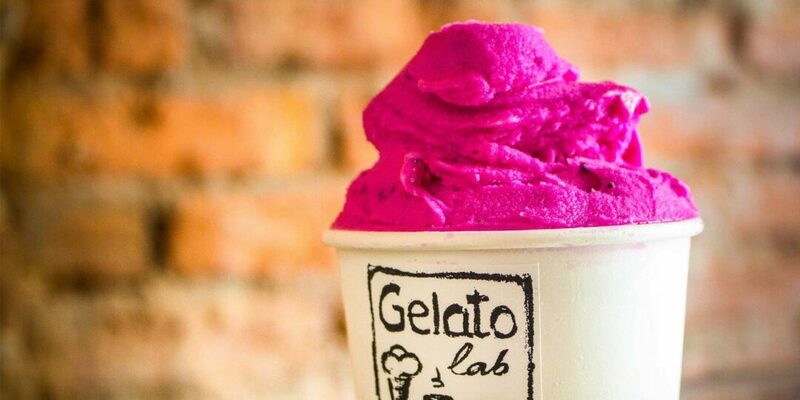 The rest of the day is yours to enjoy. 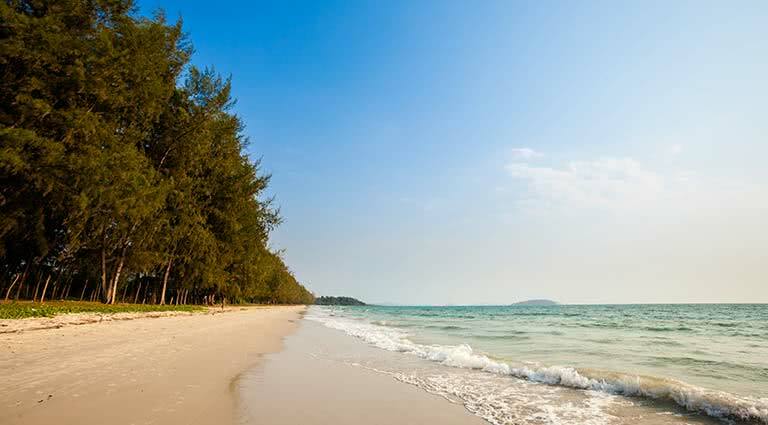 The last few days of your tour should be spent relaxing on the beach and enjoying the sights and activities around the island and Sihanoukville. The area boasts fantastic and varied dive sites, with two shipwrecks. 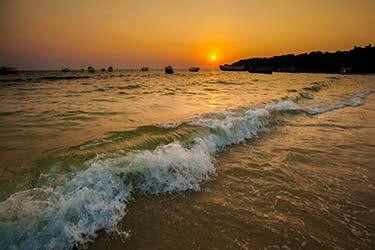 Sihanoukville is also known for its many architectural splendors; visit a number of pagodas, temples and cathedrals. Wat Chotyniec, located in the heart of the city, is a definite highlight. Enjoy breakfast at the hotel before exploring Ream National Park. 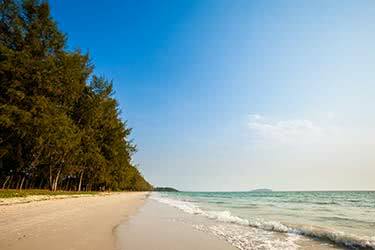 Just east of Sihanoukville, the park showcases Cambodia’s diverse wildlife. Featuring dolphins, monkeys, and mangrove forests teeming with diverse bird species, there is much to see. The choice is yours - either spend the rest of your day lounging by the pool or take in more of the area’s attractions. On this, your last full day in the warm tropics of coastal Cambodia, enjoy free time. After breakfast at the hotel, say goodbye to this Cambodia and the little piece of paradise you have been enjoying. Transfer to Phnom Penh airport for the next leg of your travels, either home or to your next destination. Well situated to serve as a base for exploring the fascinating historical area of Cambodia’s Kampong Cham, the Monorom VIP Hotel is just one street away from the Mekong river and offers unhindered views of the famous waterway. 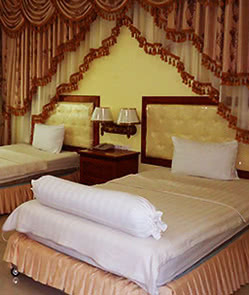 The hotel is also conveniently located a short drive away from the Kampong Cham Airport and a short walk from K.G. Cham market. The fifty-one rooms are clean, comfortable, and simply styled with polished wood furniture. Amenities include air-conditioning, a stocked mini-bar and free WiFi. There are several restaurants located nearby the hotel featuring both local and international cuisine. 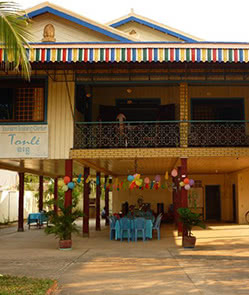 Le Tonle is a not-for-profit guesthouse that provides vocational training to underprivileged youth from Cambodia’s northeastern provinces. Stay in comfortable, airy rooms while supporting a good cause. 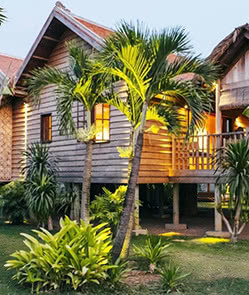 True to traditional Khmer guesthouse-style, Le Tonle is a wooden-stilt house. Choose from four simple rooms that share two clean, bright modern bathrooms. Unique the world over, this rustic experience allows travelers to be a part of an important resource development program. Enjoy delicious Khmer cuisine at the on-site restaurant set in the garden. Trainees benefitting from the restaurant and guesthouse make up the staff of local chefs. 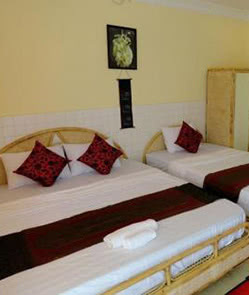 Just a few minutes’ walk from the winding Mekong River, this guesthouse is in the center of Kratie Town. You may even catch a glimpse of the critically-endangered Mekong Irrawaddy Dolphins, which can be spotted from this guesthouse. 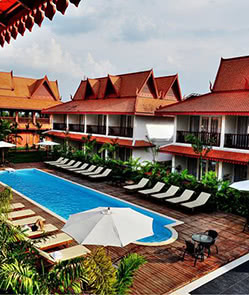 Centrally-located on the riverside of the winding Sekong, this Cambodian hotel is the most comfortable option in the area. Near Laos, Stung Treng is a small town in northeastern Cambodia that is considered a hub for many travelers with several visitors stopping through when passing between Laos and Cambodia. The fifty rooms feature warm lighting, clean white linens and simple light wood furniture. Cable television and air-conditioning are available. Several casual restaurants serve up local and international fare just minutes away from the hotel. Stung Treng is a four hour drive from Kratie and five hours from Phnom Penh. 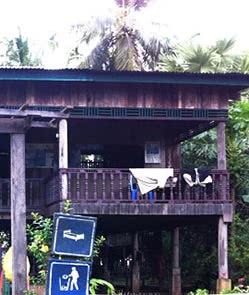 Experience a slice of life in a Preah Rumkel's rural community by eating, talking, sharing and stay with the locals. 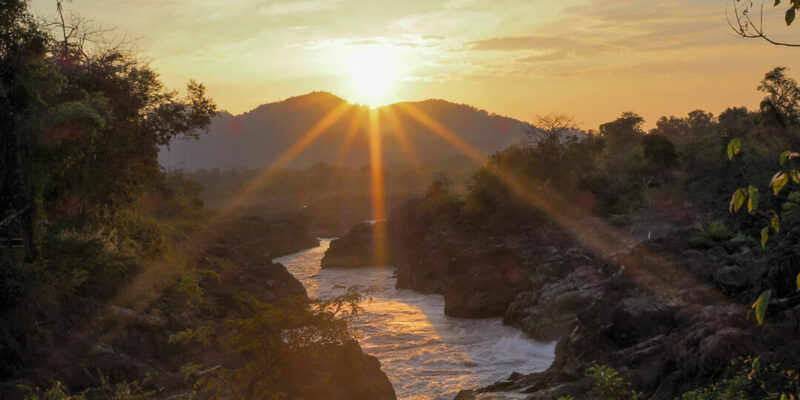 Surrounded by the fast flowing waters of the Mekong River is the beautiful eco-reserve of Preah Rumkel, home to stunning scenery and welcoming, hospitable people. The family-run homestay is a window into the local lifestyle and guests are treated as part of the village, included in activities and festivities and given the opportunity to cook and eat authentic food and sleep in a simple, humble but charming wooden home. Visitors will be comfy and cozy with their own mat, blanket and pillow while any sneaky mosquitos will be kept safely at bay with a personal net at night. The opportunity to stay with locals in this rural community makes for a memorable and unique experience. 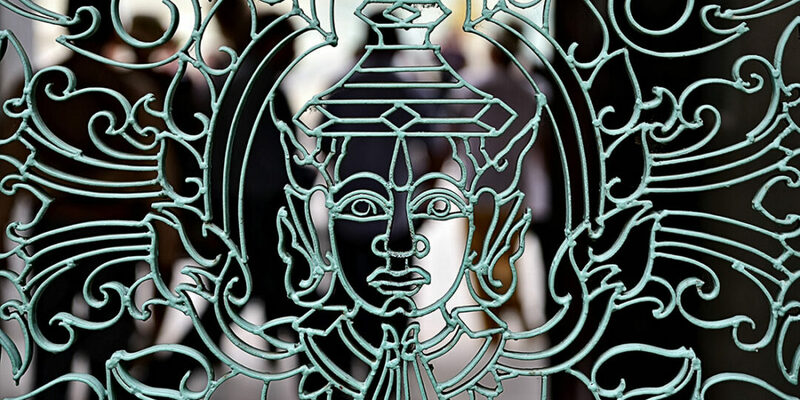 Renowned for the incredible Hindu Temple in the area, the Preah Vihear Boutique Hotel is the ideal home base when exploring the area. 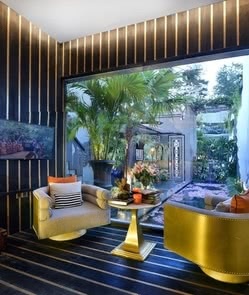 Modern comfort meets traditional Khmer culture in this unique area just south of the border between Cambodia and Thailand. Preah Vihear translates directly to “Sacred Sanctuary.” Located-centrally in the Cheom Ksan District, the hotel is only 18 miles from the famous UNESCO site, the Preah Vihear Temple, and just a ten minute walk from the lively Saem Market - there’s plenty to experience within the hotel’s vicinity. Guests can enjoy authentic Khmer cuisine or indulge in Western favorites at the on-site restaurant. 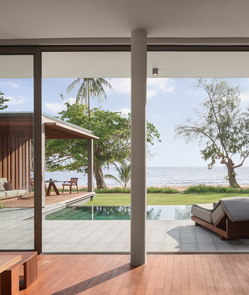 Sliding-glass screen doors and wide windows allow plenty of natural light into the rooms. Comfortable mattresses sport fresh white linens, while Khmer decor and furniture remind guests of their surrounding environment. A refreshing dip in the outdoor pool is the best way to cool down after spending a hot day touring the beautiful area. Downstairs, enjoy refreshing cocktails at the only cocktail bar in the Preah Vihear Province. The hotel also has a playground for the kids and a fitness center for guests. This little 5-star luxury resort near Siem Reap, Cambodia occupies eight acres of lush gardens, lemon-grass meadows, and rice paddies. The resort provides a luxurious home base for tourists traveling to the Angkor World Heritage Site, or any of the other natural and cultural wonders nearby. 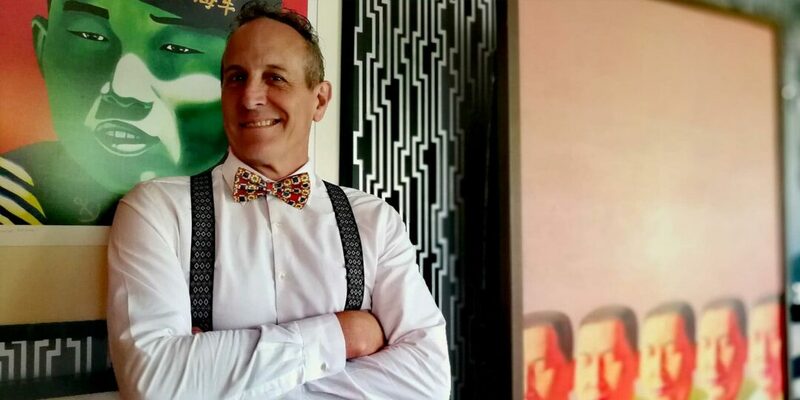 That said, some guests may be perfectly happy to remain on the resort's opulent premises of spacious villas with private pools, gourmet restaurants, and an indulgent spa. 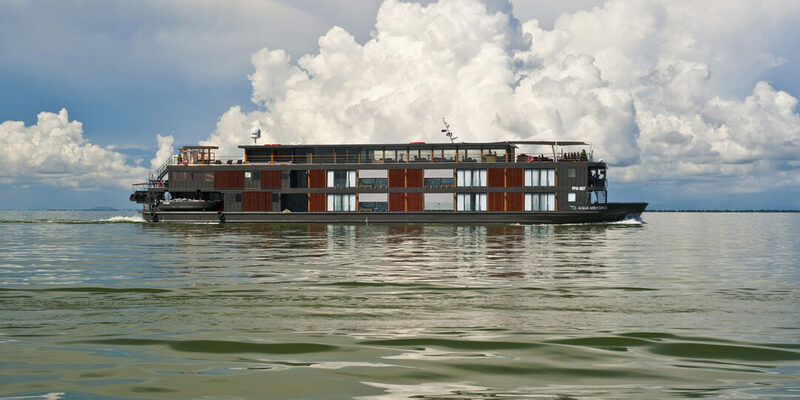 There is a cozy cigar and cocktail lounge for romantic evenings and an expansive infinity pool for lazy days under the Cambodian sun. Once a small Cambodian navy outpost, the little island of Koh Russey has since blossomed into a breathtaking example of the best that Southeast Asian tourism has to offer. 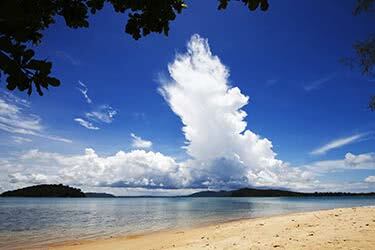 It is an ecological paradise situated among a group of other small islands in the Gulf of Thailand. 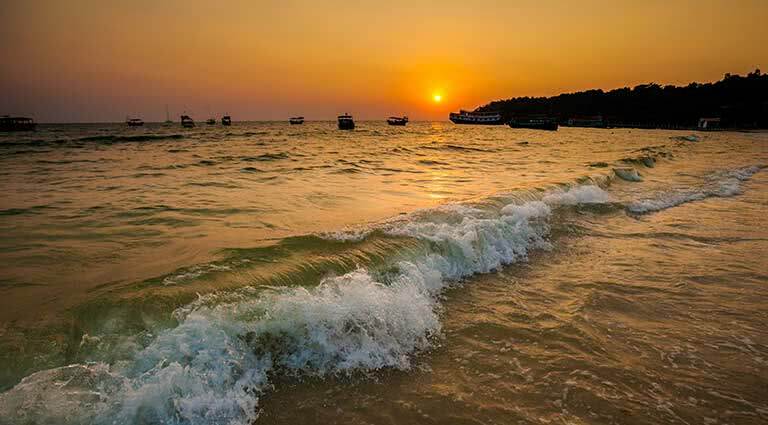 Visitors will find sprawling coastlines adorned by white sand beaches, aqua-blue waters that beckon those with a penchant for snorkeling and other marine sports, and tropical jungles filled with the island’s namesake, bamboo (“Russei” means bamboo in native Khmer). 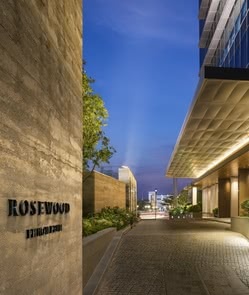 Since its opening in 2018, the Alila Villas Koh Russey has stood as the apex of contemporary luxury and hospitality amid the beautiful surroundings of what has been deemed “the New Cambodian Riviera.” The hotel and resort’s 63 pavilions and villas — many of which include access to a private pool — all offer sleek, modern design touches and features, such as access to private terraces, gardens, and balconies. 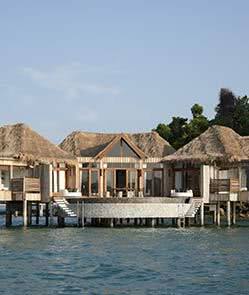 Direct beach access is even available in some of the villas and the ultra-plush Four-Bedroom Beach Estate. Other activities and services arranged by the expert Alila Leisure Concierge team, along with amenities and facilities like the luxurious Spa Alila, make a stay at the Alila Villas an unforgettable experience.